I'm new to trains and have purchased one for under the tree. I need to run power to the buildings and was hoping for an easy solution that could be connected and disconnected easily. Is there wiring kits that can be purchased. I was hoping to attach to a power rail instead of separate power sources. Most analog speed controllers have 'accessory' terminals for things like that. Which controller came with your set? I'll have to look when I get home, but it has an auxiliary connection. But my thought was, instead of running a bunch of wires to it. I could connect one wire strip with multiple connections that ran to the tree or center of the scenery and then have every electrical object connect to that. IT would seem there would be something out there already made and not something that I would have to fabricate. You could plug a few 'wall warts' into the power strip for the buildings. As I recall HO accessories run on 12v to 16v AC. It's not a huge deal, you just need to run two wires from your auxiliary posts to a point where you can have the other wires join them. You can just wire things together at that point, or you can look into the wiring supplies that are available from a hobby shop, dollhouse supplier or an electronics house like Radio Shack. These would include things like terminal strips, jumpers for said strips, and good old wire. Depending on what you are using for bulbs, you may want to wire at least some lights in series. This has the effect of reducing voltage to individual bulbs. It cuts down on the light, but also extends bulb life considerably. The other wiring scheme is parallel, which is what is in your house. All bulbs (or your appliances, etc.) get the same voltage. The two can be combined, depending on how many bulbs you may want in series at any point, or how much you want to reduce the voltage. The particular arrangement shown below would reduce the voltage to each bulb by 50%, assuming the bulbs are matched. In other words, if you have 16 volts coming out of your auxiliary terminals, then each bulb in this case would get only 8 volts. That would be well under the typical 12 volt ratings of the bulbs in the railroad hobby, and would result in a nice golden glow instead of an overly bright light--which would also signify voltage being higher than it should and shorter bulb life, sometimes measured in seconds or less! Do keep in mind that while these voltages are very low compared to your house current, you do need to make sure you have no bare wires, especially bare wires that can touch another of opposite polarity. That will be what's called a short circuit, and even at only a couple of volts from a battery would result in an amazing amount of heat buildup and a fire hazard! It's not a big deal to prevent that, but it does require you take a few common sense precautions, such as what I mentioned above. I was wondering if you knew what size spade terminal usually comes with the power supply? I would take your power supply to whomever you're getting your wire and other things from to match up the size. Most model railroad power supplies use the same size. 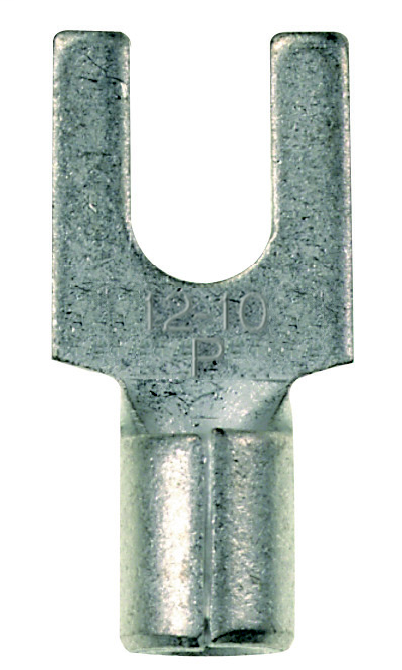 Typically what you'll be looking for is what's called a fork connector, which looks like this. . .
Of course, you may have something different. Do you have a brand name or a photograph available of what you're using?